HIC's authentic gold tone reusable number 2-size coffee filter is designed for making coffee in automatic coffee makers or those specialty coffee accessories designed for manual Japanese coffee brewing methods known as pour-over, hand pour or hand drip coffee. HIC's gold tone reusable coffee filters are convenient to use and make cleanup is a breeze. Flavorful coffee oils aren't filtered out, resulting in a more distinct, rich, and complex brew. More economical than using paper coffee filters and reduction of waste makes them the perfect coffee accessories for sustainable living practices. Brews 2 to 6-Cups. Easy to use. Simply place the gold coffee filter into the automatic or manual coffee maker. Measure in desired amount of ground coffee, or grind whole beans fresh, then brew according to instructions. Drink the fresh-brewed coffee immediately or chill to make iced coffee and other coffee drinks. After brewing coffee, raise the attached handle to remove the coffee filter, empty contents and wash thoroughly between uses. 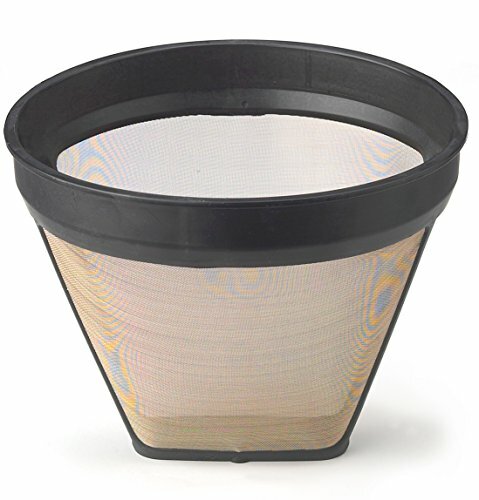 HIC's authentic gold tone reusable coffee filter will last for years. Made from surgical stainless steel for durability and easy cleanup. Dishwasher safe. Proudly made in USA. 5-Year warranty.